PfHsp70-x partially associates with Maurer’s clefts but not with knobs: (A–B) Panel I: the signal for PfHsp70-x (green) was obtained in the parasite compartment along with few punctate spots in the erythrocyte compartment. Panel II: MAHRP1 (red) stained discrete foci representative of Maurer’s clefts in the erythrocyte periphery. Panel III: the DIC image of the infected erythrocyte. Panel IV: merged image overlaid with DIC image reveals that MAHRP1 and PfHsp70-x partially co-localize in the erythrocyte compartment, suggesting that PfHsp70-x possibly associates with Maurer’s clefts. (C-D) Panel I: the signal for PfHsp70-x (green) was obtained in the parasite compartment along with few punctate spots in the erythrocyte compartment. Panel II: KAHRP (red), being a constituent of knobs, stained the entire erythrocyte membrane. Panel III shows the DIC image of the infected erythrocyte. 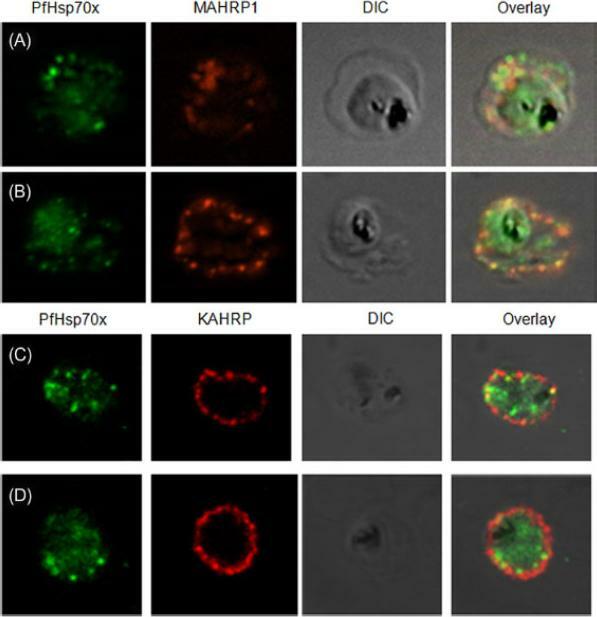 Panel IV: no co-localization is observed between KAHRP and PfHsp70-x, suggesting that PfHsp70-x does not associate with knobs on the infected erythrocyte membrane.Grover M, Chaubey S, Ranade S, Tatu U. Identification of an exported heat shock protein 70 in Plasmodium falciparum. Parasite. 2013;20:2. Parasites were tagged by single cross-over homologous recombination, the endogenous gene locus to include the GFP coding sequence. PFA660INT. 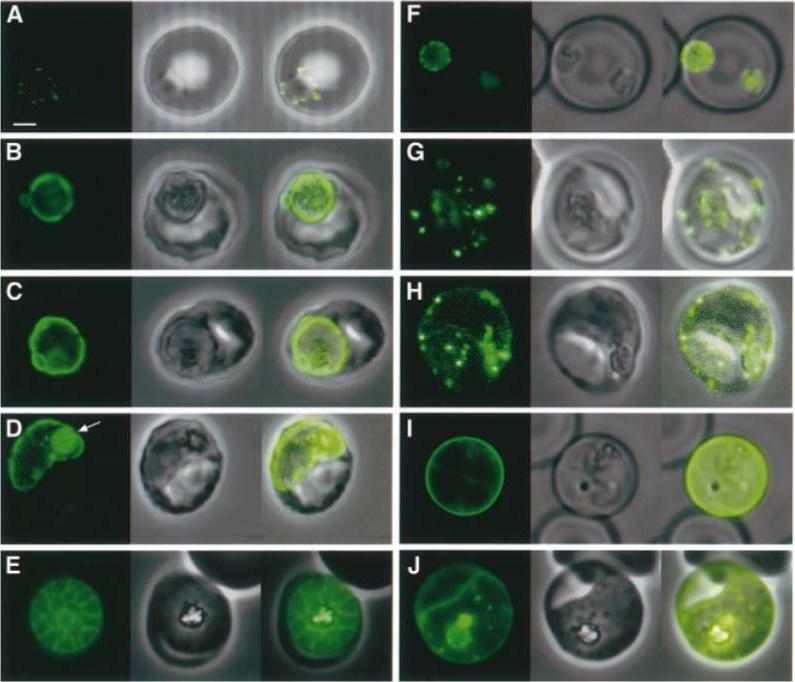 Co-immunofluorescence analysis on erythrocytes infected with PFA660INT, using anti-sera directed against STEVOR (A), MAHRP1 MAL13P1.413 (B), KAHRP PFB0100c (C). Fluorescence channels are shown individually in black/white for highest contrast. All images are maximal projections of Z-stack serial sections. In merge image green, GFP; red, STEVOR (A), MAHRP (B), KAHRP (C) or ATS domain of PfEMP1 (D); blue, Hoechst. Inset shows enlargement of merge (white box). The fusion protein labelled punctate structures within the infected erythrocytebut clearly not in Maurer’s clefts.Külzer S, Rug M, Brinkmann K, Cannon P, Cowman A, Lingelbach K, Blatch GL, Maier AG, Przyborski JM. 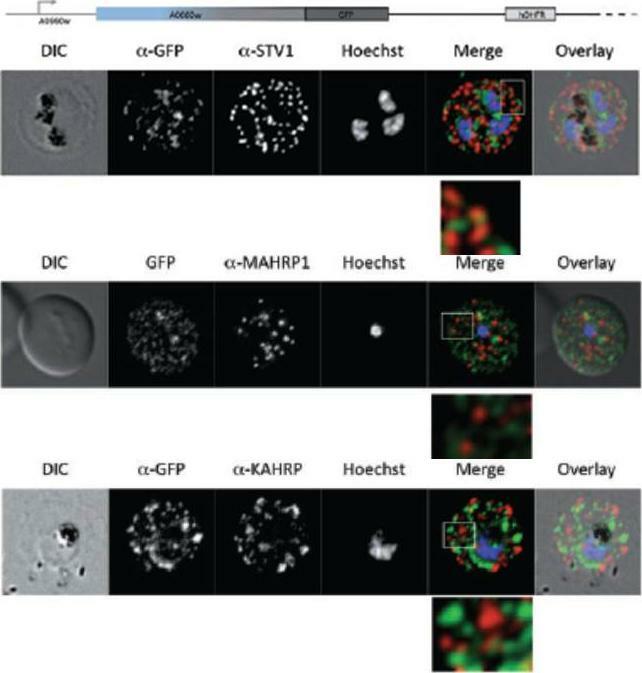 Parasite encoded Hsp40 proteins define novel mobile structures in the cytosol of the P. falciparum infected erythrocyte. Cell Microbiol. 2010 12(10):1398-420. Copyright John Wiley & Sons Ltd. 2010. (A) live cell fluorescence microscopy of 3D7-KAHRP-GFP. Panels are GFP fluorescence, bright field (BF) and a merge of the two. Scale bar: 5 μm. 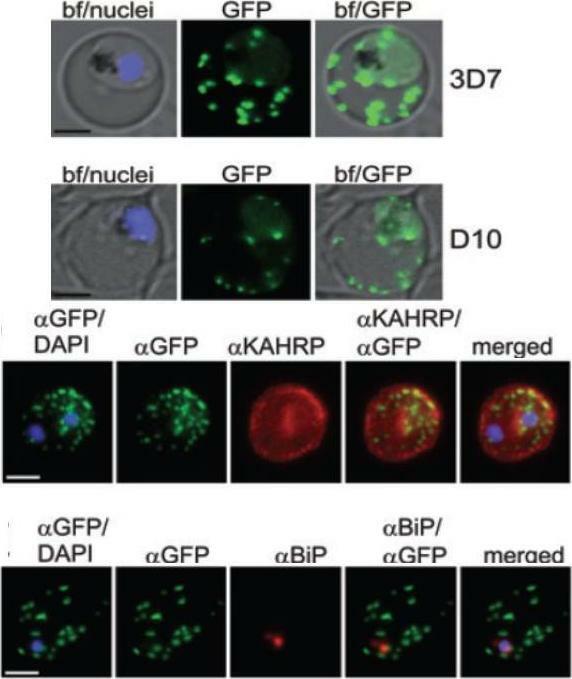 KAHRP-GFP was trafficked to the RBC membrane and gave a rim fluorescence pattern (B) Immunofluorescence microscopy of acetone-fixed RBCs infected with 3D7-KAHRP-GFP, SBP1 is a marker for the Maurer’s clefts. Lower row: Immunofluorescence microscopy of acetone fixed RBCs infected with wild type. Smears were probed with mouse anti-PfEMP3 (green) and rabbit anti-SBP1 (red). A characteristic PfEMP3 profile at the RBC membrane is seen.Dixon MW, Kenny S, McMillan PJ, Hanssen E, Trenholme KR, Gardiner DL, Tilley L. Genetic ablation of a Maurer's cleft protein prevents assembly of the Plasmodium falciparum virulence complex. Mol Microbiol. 2011 81(4):982-93. 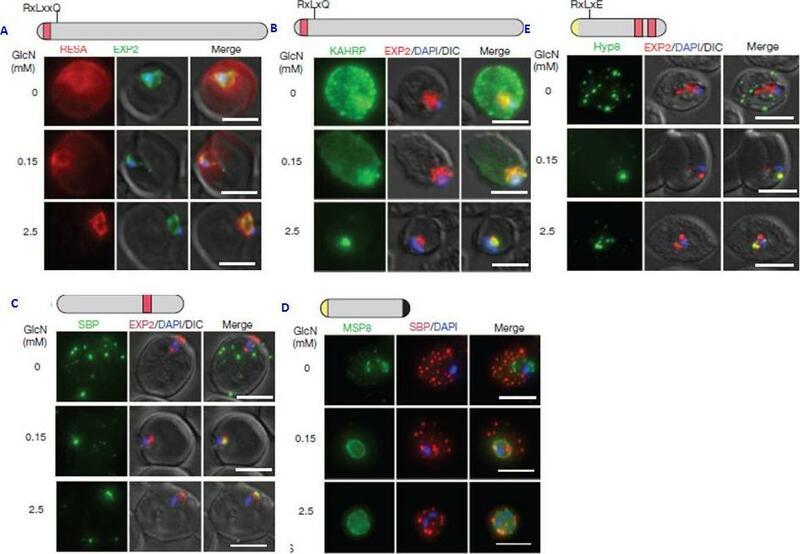 Stage analysis of HRPl (KAHRP) and PfEMP3 synthesis in PE by IFA and confocal microscopy. Both the MC K+ and the FCR-3 K+ parasites were analyzed, each producing the same fluorescent patterns. HRPl was detected with mAb89 and PfEMP3 was detected using chicken anti-PfEMP3 polyclonal antibody. The images in the first (fluorescent) and second (transmitted light) columns are using anti-HRPl antibody. The images in the third (fluorescent) and fourth (transmitted light) columns are using anti-PfEMP3 antibody. Panels A and B, ring stage (12-15 h); panels C and D, early- to mid-trophozoite stage (24-30 h); panels E and F, schizont stage (40-48 h). The arrowheads designate the erythrocyte membrane of the parasitized eryhtrocyte. Pasloske BL, Baruch DI, Ma C, Taraschi TF, Gormley JA, Howard RJ. PfEMP3 and HRP1: co-expressed genes localized to chromosome 2 of Plasmodium falciparum. Gene. 1994 144:131-6. Copyright Elsevier 2010. Subcellular localization of PfEMP3 and HRP1 (KAHRP) by immunoelectron microscopy. Fixed trophozoite PE embedded in LR white resin were incubated with either mAb 89 KAHRP (A and B) or mouse anti-RP serum PfEMP3 (C and D). 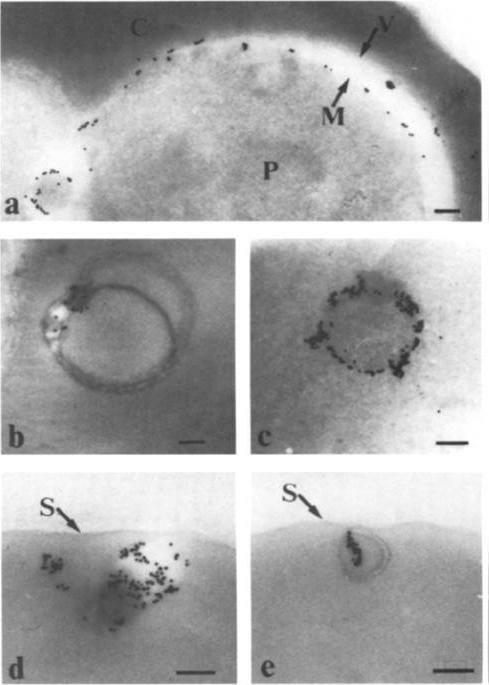 In panels A and B, the arrows indicate the gold particles considered below the erythrocyte membrane. Bars, 0.1 mm.Pasloske BL, Baruch DI, van Schravendijk MR, Handunnetti SM, Aikawa M, Fujioka H, Taraschi TF, Gormley JA, Howard RJ. Cloning and characterization of a Plasmodium falciparum gene encoding a novel high-molecular weight host membrane-associated protein, PfEMP3. Mol Biochem Parasitol. 1993 59:59-72. Copyright Elsevier 2009. Immunolocalization of PfEMP1 (a), PfEMP3 (b) and KAHRP (c) in rings (upper row) and mature torphozoites (lower row) using specific antibodies and visualization by confocal microscopy. PfEMP3 is deposited under the membrane of the infected RBC. 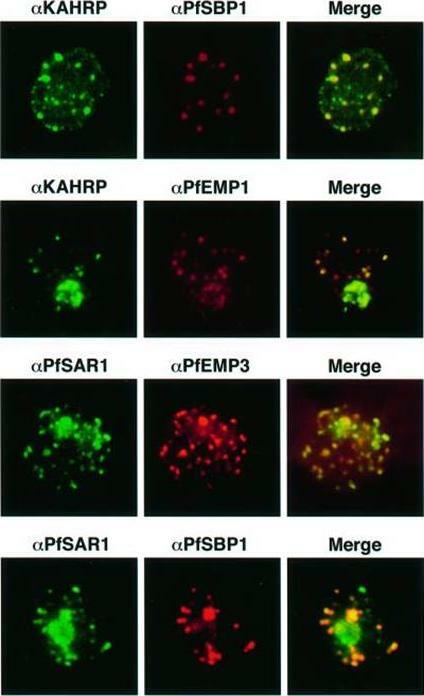 Mutation of PfEMP3 disrupts transfer of PfEMP1 to the outside of infected cells.Adapted by permission from Macmillan Publishers Ltd: Waterkeyn JG, Wickham ME, Davern KM, Cooke BM, Coppel RL, Reeder JC, Culvenor JG, Waller RF, Cowman AF. Targeted mutagenesis of Plasmodium falciparum erythrocyte membrane protein 3 (PfEMP3) disrupts cytoadherence of malaria-infected red blood cells. EMBO J. 2000 19:2813-23. Indirect Immunofluorescence Assay (IFA) was performed using anti-KAHRP antiserum. Representative IFAs are shown. KAHRP was detected in a classic punctuate pattern on the surface of trophozoites and schizonts. No labeling of KAHRP was detected in ring-iRBCs (data not shown). KARHP localizes to the RBC membrane.Waller KL, McBride SM, Kim K, McDonald TV. Characterization of two putative potassium channels in Plasmodium falciparum. Malar J. 2008 Jan 24;7:19. 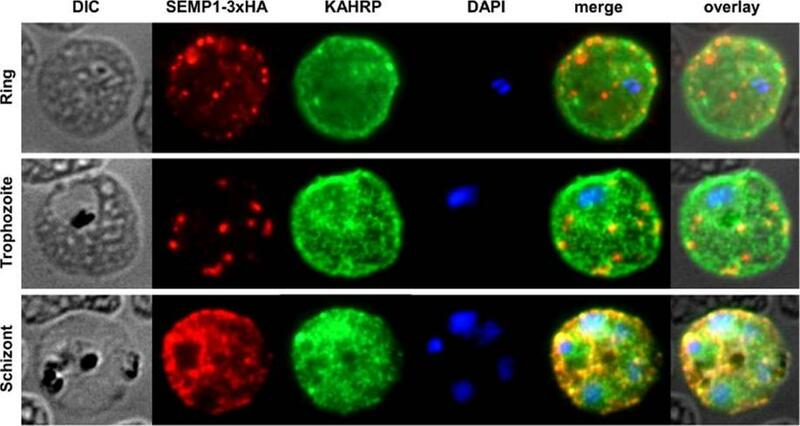 Localization and distribution of KAHRP in erythrocytes infected with P. falciparum. 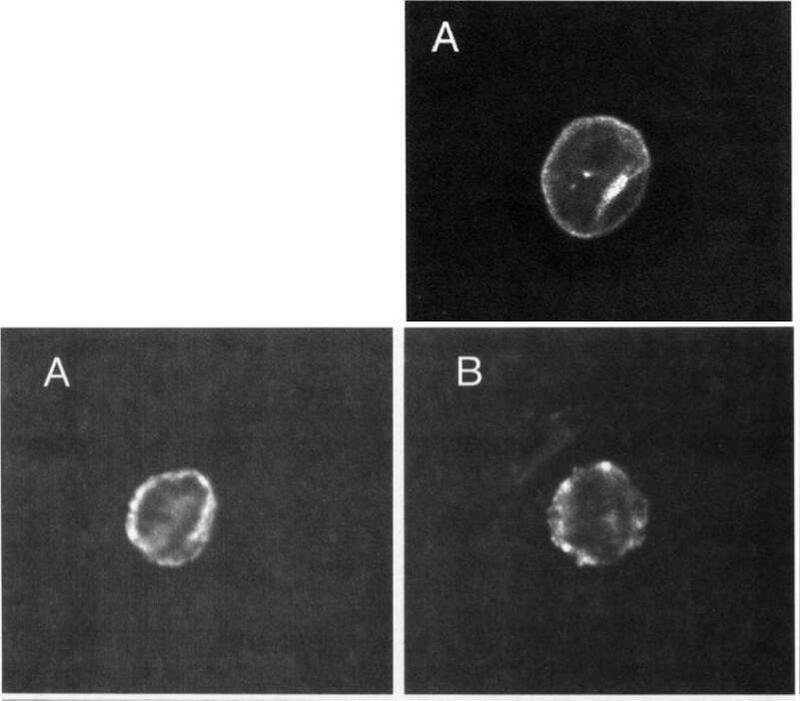 Erythrocytes were resealed without (A), with 40 mM GST (B), or with 40 mM GST-aR4 Spectrin (C). The resealed erythrocytes were infected with P. falciparum and cultured for 48 h. The localization of KAHRP was detected by immunostaining with anti-KAHRP antibody. Green, KAHRP; red: malaria DNA stained by TOPO-3.Pei X, An X, Guo X, Tarnawski M, Coppel R, Mohandas N. Structural and functional studies of interaction between Plasmodium falciparum knob-associated histidine-rich protein (KAHRP) and erythrocyte spectrin. J Biol Chem. 2005 280:31166-71. Immunolabeling of Plasmodium falciparum isolate FC27 with anti-Ag617 and protein A-4 nm gold. Bars equal 0.1 mm. 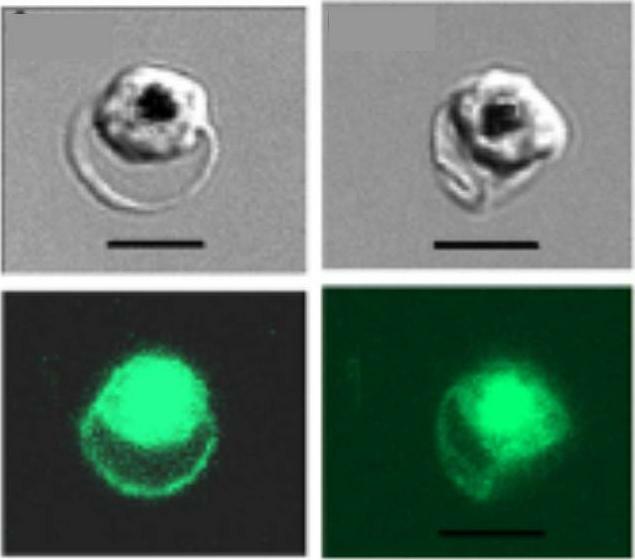 (A, B, and D) Erythrocyte surface of trophozoite infected cells showing labeling under knobby erythrocyte plasma membrane. (C) Surface of a schizont infected cell with labeling of knobs and odd gold particles over parasitophorous vacuole, erythrocyte cytoplasm, and parasite. 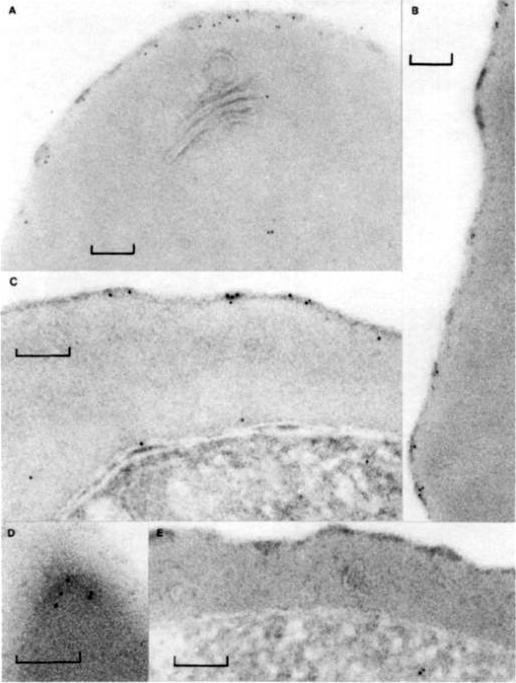 (E) Knobby surface of schizont infected cell incubated without antisera, only protein A-4 nm gold, showing no gold associated with plasma membrane.Culvenor JG, Langford CJ, Crewther PE, Saint RB, Coppel RL, Kemp DJ, Anders RF, Brown GV. 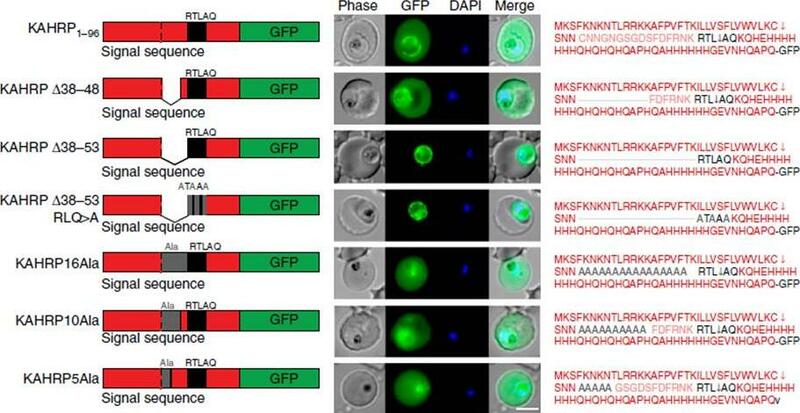 Plasmodium falciparum: identification and localization of a knob protein antigen expressed by a cDNA clone. Exp Parasitol. 1987 63:58-67. Copyright Elsevier 2010. 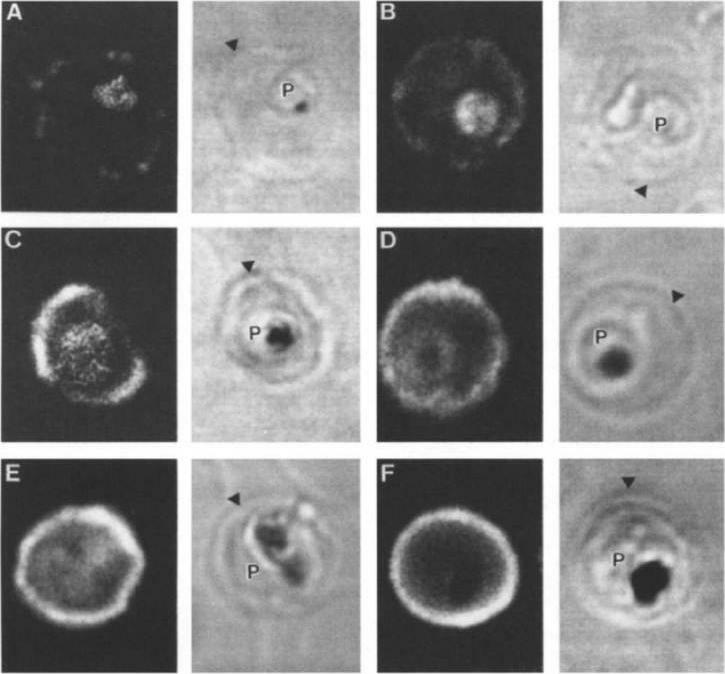 Electron micrographs of an FCR-3-infected erythrocyte incubated with anti-KAHRP antiserum followed by protein A-gold. (Bars = 200 nm). 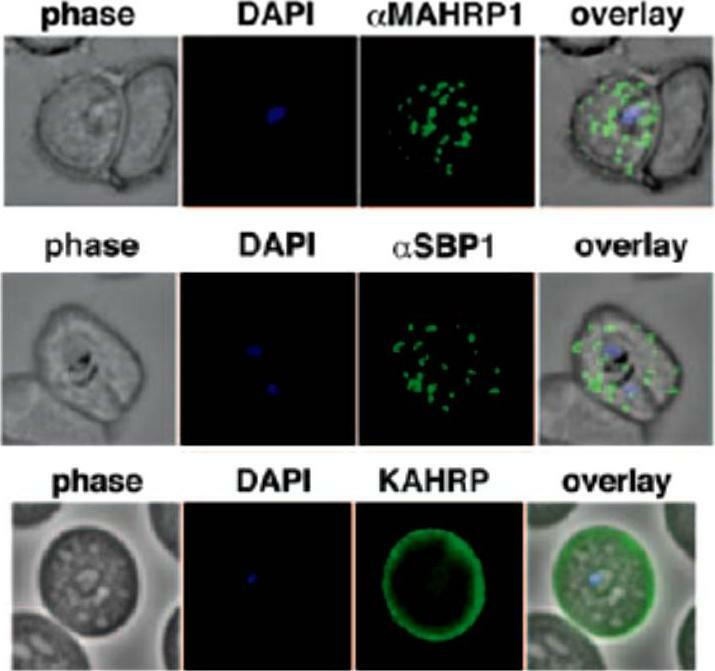 KAHRP is localized to the knob structure on the cytoplasmic side of the erythrocyte membrane. Pologe LG, Pavlovec A, Shio H, Ravetch JV. Primary structure and subcellular localization of the knob-associated histidine-rich protein of Plasmodium falciparum. Proc Natl Acad Sci U S A. 1987 84:7139-43. Copyright 2009 National Academy of Sciences, U.S.A.
PfHRP-1 is now named KAHRP (Knob associated histidine-rich protein). Immunoelectron microscopy on cryo-thin section of K ÷ P. falciparum-infected erythrocytes cultured in vitro 32 h and then treated with mAb 89 and protein A-gold. (a) PfHRP-1 is not seen within the parasite (P) but is found external to the parasite membrane (M) and in association with the parasitophorous vacuolar membrane (V). 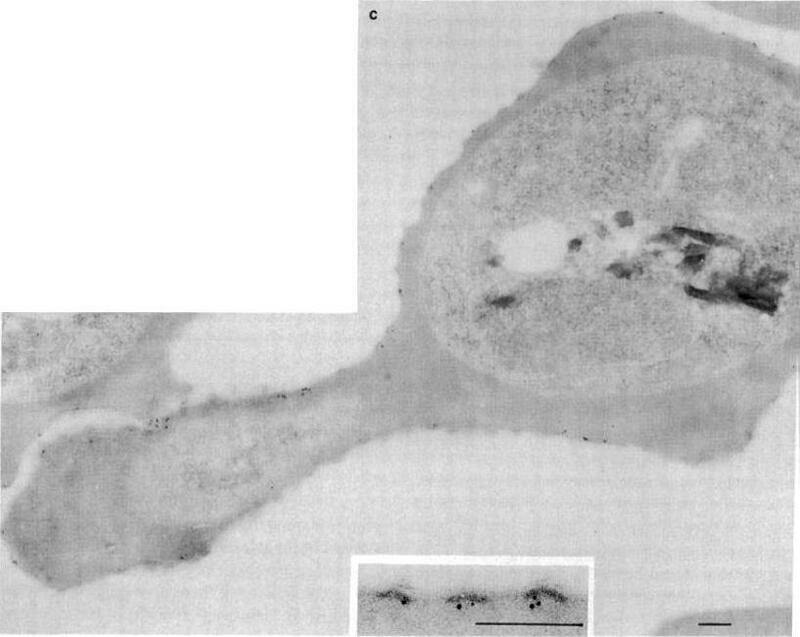 (b) PfI-IRP-1 is seen in membranous vesicles and (c, d) in electron dense granules in the erythrocyte cytosol. 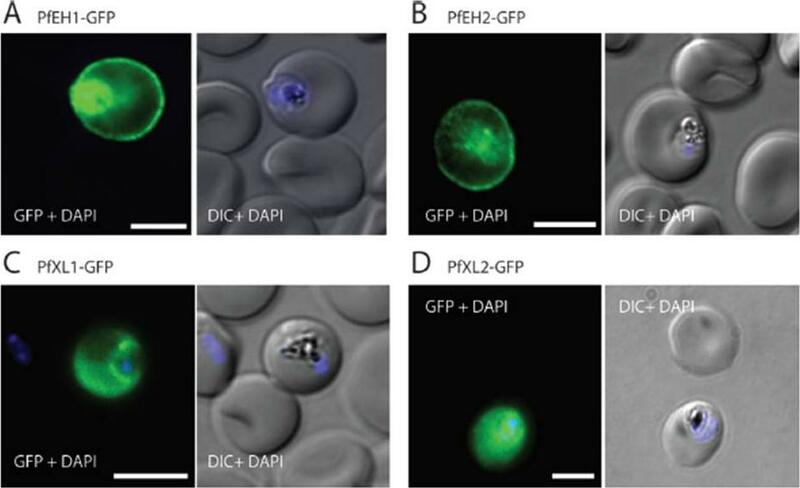 (d, e) PfHRP-1 can be seen approaching the erythrocyte membrane. Arrow identifies the erythrocyte surface (S). Bars represent 0.1 mm.Taylor DW, Parra M, Chapman GB, Stearns ME, Rener J, Aikawa M, Uni S, Aley SB, Panton LJ, Howard RJ. Localization of Plasmodium falciparum histidine-rich protein 1 in the erythrocyte skeleton under knobs. Mol Biochem Parasitol. 1987 25:165-74. Copyright Elsevier 2009. Colocalization of malarial and host proteins in the erythrocyte membrane. A blood smear of erythrocytes infected with the trophozoite stage parasites was fixed and then reacted with two different antibodies (from rabbit and from mouse) against the proteins under study. Secondary antibodies labeled with FITC (anti-rabbit) and TR (anti-mouse) were used, respectively. The left column shows the two simultaneously acquired fluorescence channels by NSOM (near-field scanning optical microscope) dualcolor imaging. The center column presents the corresponding overlay of the fluorescence images (a) Control experiment: primary antibodies against KAHRP. (b) Colocalization of MESA and protein 4.1 (a host cell membrane protein). (c) Colocalization of KAHRP and protein 4.1. 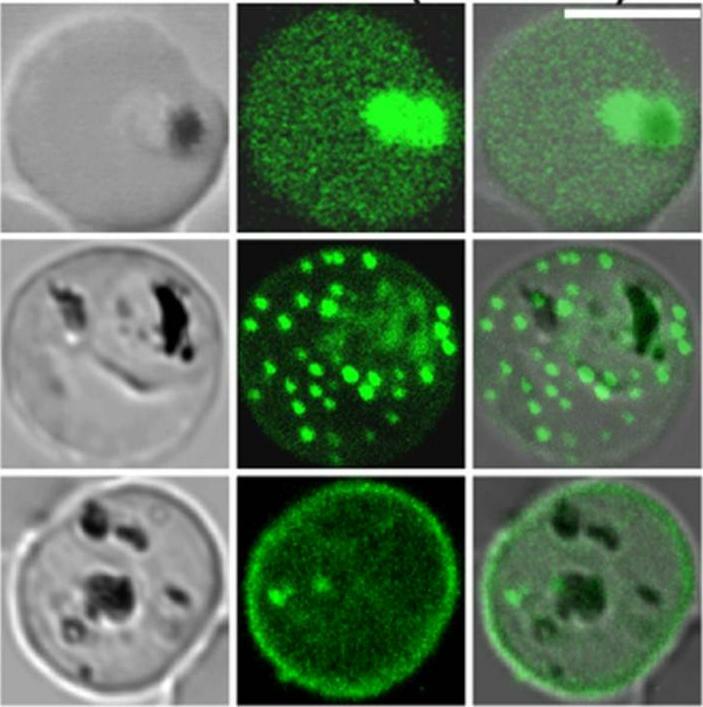 Scale bars 5 2 mm.Enderle T, Ha T, Ogletree DF, Chemla DS, Magowan C, Weiss S. Membrane specific mapping and colocalization of malarial and host skeletal proteins in the Plasmodium falciparum infected erythrocyte by dual-color near-field scanning optical microscopy. Proc Natl Acad Sci U S A. 1997 94:520-5. 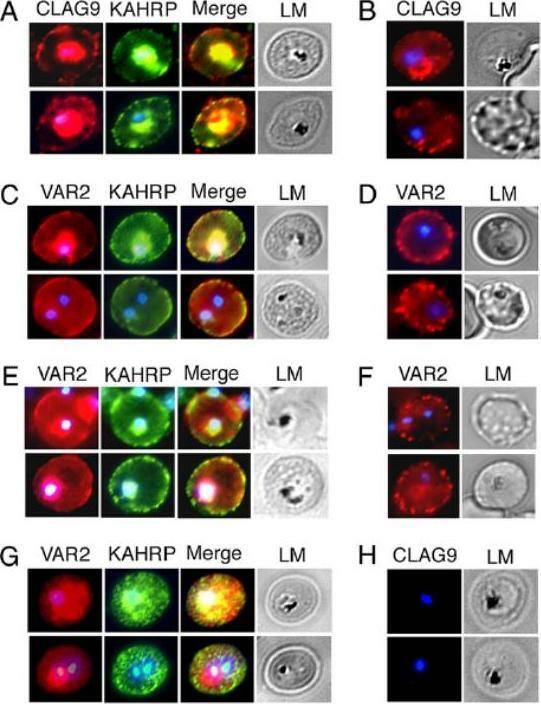 Trafficking of the knob-associated histidine-rich protein, KAHRP, in the cytosol of P. falciparum-infected erythrocytes, and its relative location to the LMV. Immunofluorescence studies were performed on air-dried monolayers of parasite cultures adapted to in vitro growth (A) Cytosolic trafficking patterns of KAHRP. Cell monolayers of TM284S2(K+) at ring (12 h), mid-trophozoite (20 h) and late trophozoite stages (32 h) were probed with mab89 antibodies. A dashed line outlines the erythrocyte membrane. (B) Staining with anti-KAHRP and anti-PfEMP1 antibodies. 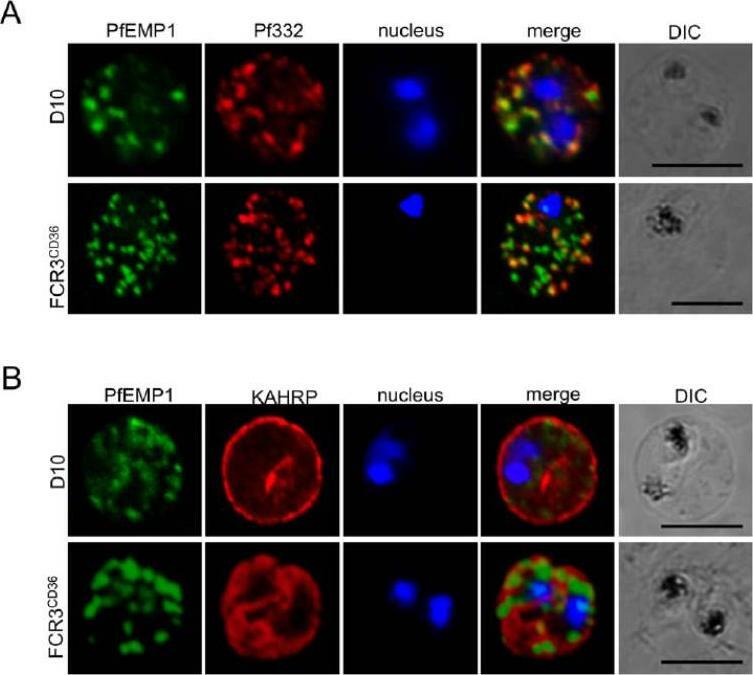 Dual localization of CY3-labeled KAHRP, (red) and FITC-labeled PfEMP1 was performed on TM284S2(K+) and FCR3S1.2(K−) parasites at trophozoite stages (≈24 h). Merged image show no co-localization in LMV. Scale bar: 1 mm.Haeggström M, Kironde F, Berzins K, Chen Q, Wahlgren M, Fernandez V. Common trafficking pathway for variant antigens destined for the surface of the Plasmodium falciparum-infected erythrocyte. Mol Biochem Parasitol. 2004 133:1-14. Copyright Elsevier 2010. Upper: Localization of MESA. Thin blood smears of mature trophozoite-infected erythrocytes were made from in vitro cultures, air-dried, and fixed with acetonelrnethanol. They were reacted at room temperature for 45 minutes with anti-MESA diluted 1:lOO in PES, washed 3 times in PES, and reacted for 45 minutes with fluorescein isothiocyanate-conjugated goat-antirabbit IgG diluted 1:lOO in PBS. Slides were again washed 3 times in PBS and mounted with SlowFade and a coverslip for examination with a confocal laser scanning microscope equipped with Nikon epifluorescence. Lower: Localization of KAHRP. Cells were prepared and examined as above except that in this case they were reacted with MoAb 89 (antiknob-associated histidine-rich protein) diluted 120 in PBS, followed by fluorescein isothiocyanate-conjugated goat-antimouse IgG diluted 1:lOO in PBS.Magowan C, Coppel RL, Lau AO, Moronne MM, Tchernia G, Mohandas N. Role of the Plasmodium falciparum mature-parasite-infected erythrocyte surface antigen (MESA/PfEMP-2) in malarial infection of erythrocytes.Blood. 1995 86:3196-204. Parasites were tagged by single cross-over homologous recombination, the endogenous gene locus to include the GFP coding sequence. PFE55INT. Co-immunofluorescence analysis on erythrocytes infected with PFE55INT, using anti-sera directed against STEVOR (A), MAHRP1 MAL13P1.413 (B), KAHRP PFB0100c (C). Fluorescence channels are shown individually in black/white for highest contrast. All images are maximal projections of Z-stack serial sections. In merge image green, GFP; red, STEVOR (A), MAHRP (B), KAHRP (C) or ATS domain of PfEMP1 (D); blue, Hoechst. Inset shows enlargement of merge (white box). The fusion protein labelled punctate structures within the infected erythrocytebut clearly not in Maurer’s clefts.Külzer S, Rug M, Brinkmann K, Cannon P, Cowman A, Lingelbach K, Blatch GL, Maier AG, Przyborski JM. 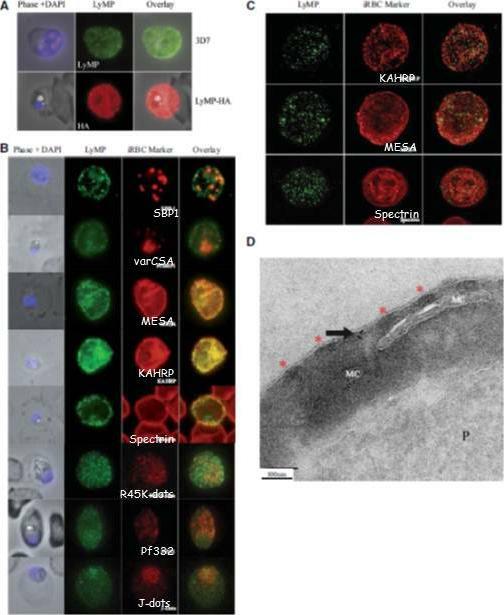 Parasite encoded Hsp40 proteins define novel mobile structures in the cytosol of the P. falciparum infected erythrocyte. Cell Microbiol. 2010 12(10):1398-420 Copyright John Wiley & Sons Ltd. 2010. Localization of the resident Maurer clefts markers PfSBP1 and PfMAHRP1 in CS2. Both proteins trafficked to Maurer’s clefts. 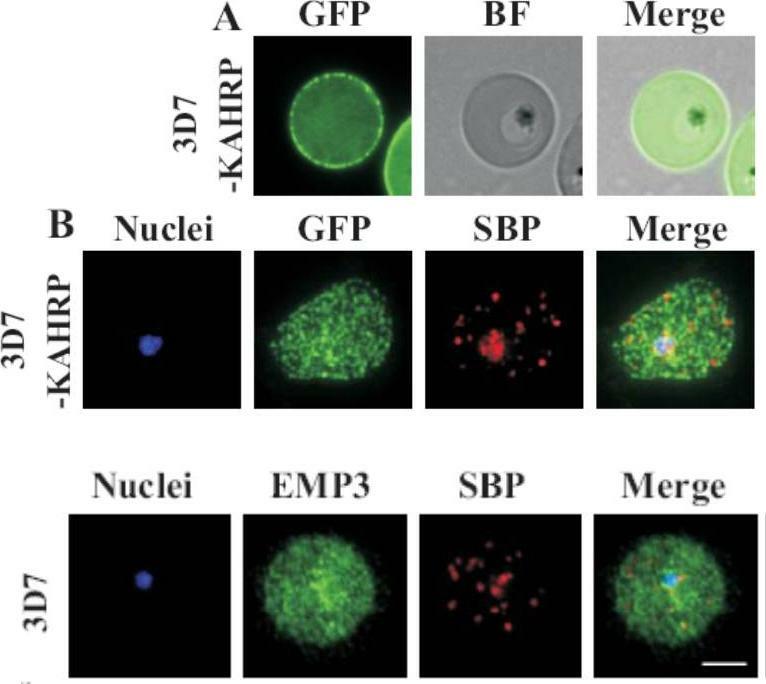 KAHRP is trafficked normally to the erythrocyte membrane and assembled into knob structures.Maier AG, Rug M, O'Neill MT, Beeson JG, Marti M, Reeder J, Cowman AF. 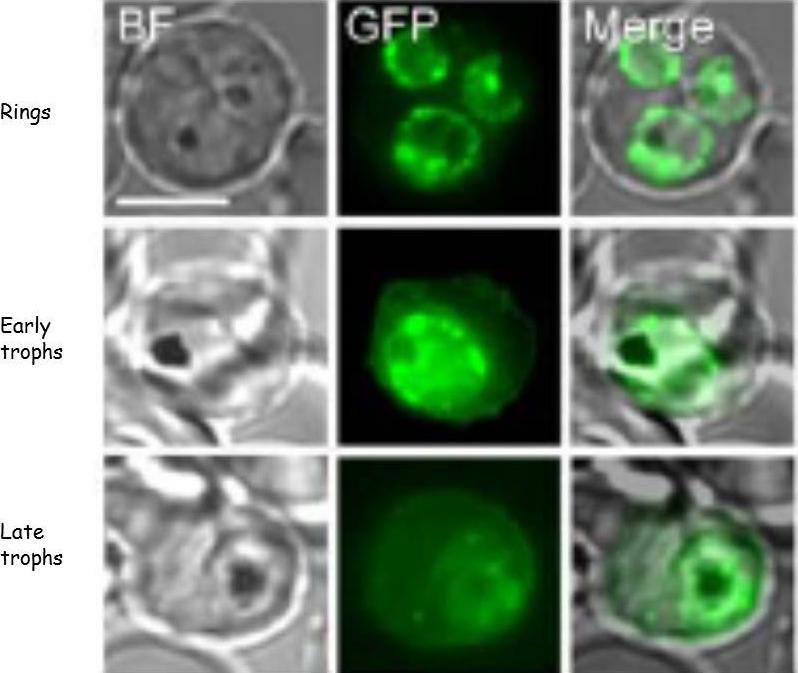 Skeleton-binding protein 1 functions at the parasitophorous vacuole membrane to traffic PfEMP1 to the Plasmodium falciparum-infected erythrocyte surface. Blood. 2007 109:1289-97. A. Labeling of CLAG9 in 3D7 and E5KO. Note there is labeling of E5KO (clag9 knockout) rhoptries with mAb7H8/50 that reveals RAP3, but not with anti-CLAG9 specific sera due to gene disruption. Scale bars = 5 mm. B. Trafficking of PfEMP1 and KAHRP by E5KO; labeling was identical to 3D7. Scale bars = 5 mm. CLAG9 was not detected in the knockout clone E5KO. These results show that the clag9 gene product is not directly implicated in cytoadhesion to CD36.Nacer A, Roux E, Pomel S, Scheidig-Benatar C, Sakamoto H, Lafont F, Scherf A, Mattei D. clag9 is not essential for PfEMP1 surface expression in non-cytoadherent Plasmodium falciparum parasites with a chromosome 9 deletion. PLoS One. 2011;6(12):e29039. Localization of parasite exported proteins. A. Double-labelling of synchronous air-dried D10 (top row) and FCR3 panned on CD36 (FCR3CD36) (bottom row) with guinea pig anti-PfEMP1 antibodies (1:500) and purified rabbit anti-Pf332 IgG (1:200) revealed with a mixture of goat anti-guinea pig Alexa Fluor 488 (1:500) and Alexa Fluor 594-conjugated anti-rabbit IgG (1:1000). 332 (a Maurer’s clefts marker) and PfEMP1 were associated with the Maurer’s clefts in transit through the RBC cytoplasm. B. Labeling of PfEMP1 (1:500, green) and knobs on the PRBC surface with monoclonal anti-KAHRP (mAb89, 1:800, red), followed by anti-guinea pig Alexa Fluor 488 and anti-mouse Alexa Fluor 594. Scale bars: 5 mm. 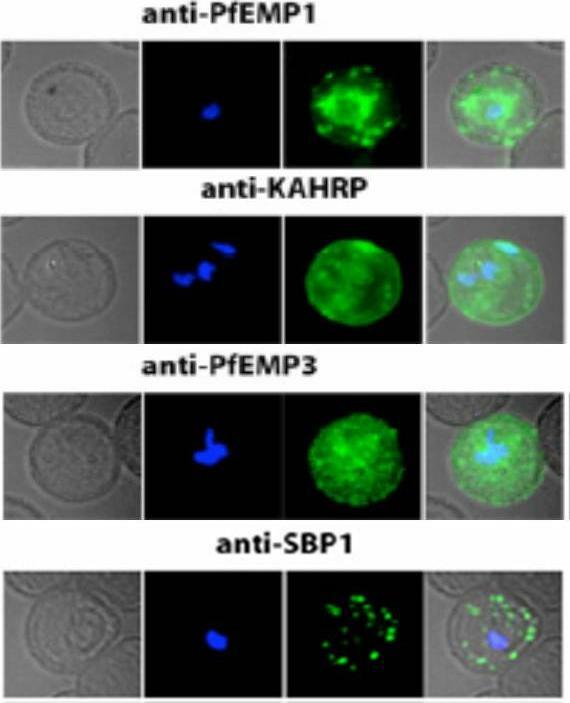 KAHRP, which interacts with the PfEMP1 ATS region, is correctly addressed to the RBC membrane.Nacer A, Roux E, Pomel S, Scheidig-Benatar C, Sakamoto H, Lafont F, Scherf A, Mattei D. clag9 is not essential for PfEMP1 surface expression in non-cytoadherent Plasmodium falciparum parasites with a chromosome 9 deletion. PLoS One. 2011;6(12):e29039. 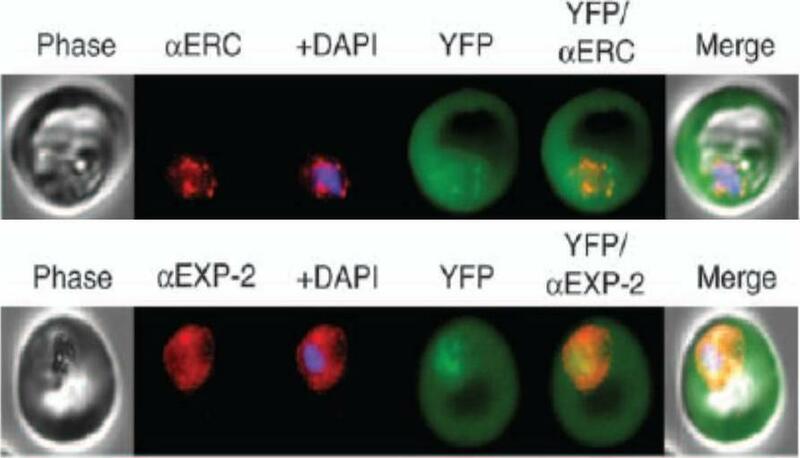 Localization of PfEMP1, KAHRP, PfEMP3 and SBP1 in P. falciparum-infected erythrocytes. The first column of each panel shows a bright-field image, the second panel specific antibody and the third panel overlay of the previous two and a nuclear stain (DAPI). 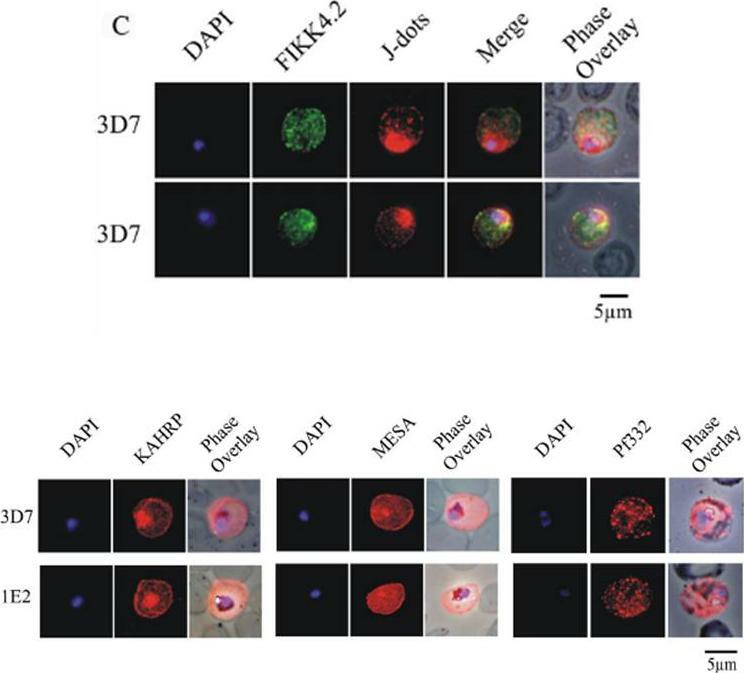 PfEMP1 displays and functions on the surface of infected erythrocytes. KAHRP and PfEMP3 are exported to the erythrocyte cytoplasm and interacts with Maurer’s clefts and eventually reach the inner side of the host cell membrane. SBP1 is a Maurer’s clefts resident protein.Maier AG, Rug M, O'Neill MT, Brown M, Chakravorty S, Szestak T, Chesson J, Wu Y, Hughes K, Coppel RL, Newbold C, Beeson JG, Craig A, Crabb BS, Cowman AF. Exported proteins required for virulence and rigidity of Plasmodium falciparum-infected human erythrocytes. Cell. 2008 134:48-61. VAR2CSA and CLAG9 localize predominantly to IRBC membranes of C4S-adherent parasites. 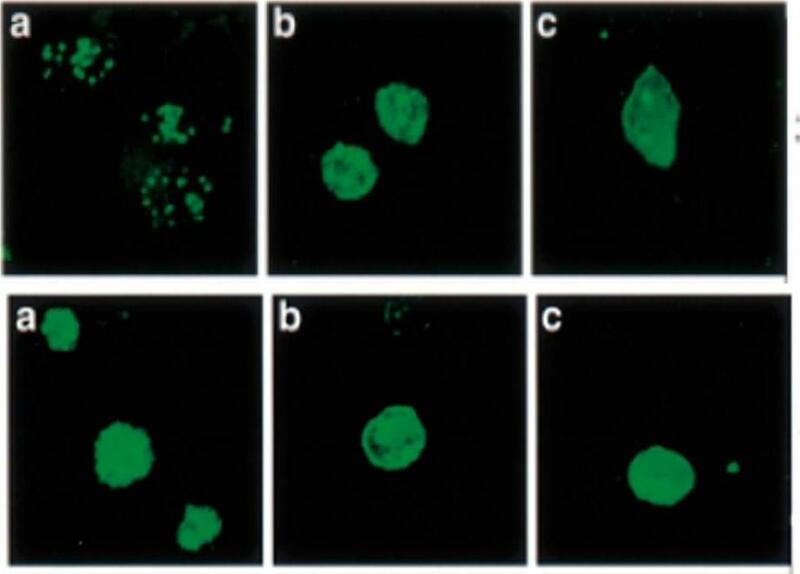 Immunofluorescence and light micrographs (LM) of membrane-permeabilized (A and C) and intact (B and D) IRBCs of C4S-adherent FCR3 parasites, harvested at the late ring/early trophozoite stage, were stained by using rabbit anti-CLAG9 (A and B), rabbit anti-VAR2CSA (C and D), and mouse anti-KAHRP (control) antibodies at dilutions given in SI Materials and Methods. (E and F) Immunofluorescence and LM of permeabilized (E) and intact (F) C4S-adherent 3D7 IRBCs stained as above with anti-VAR2CSA antibodies. (G and H), Immunofluorescence and LM of permeabilized clag9−/− parasites stained with anti-VAR2CSA antibodies (G) and anti-CLAG9 antibodies (H). Anti-CLAG9 antibodies showed a strong staining of the IRBC membrane (A). A substantial level of CLAG9 is located at or in close proximity to the erythrocyte membrane. Nonpermeabilized IRBCs also showed onsiderable levels of staining of the erythrocyte surface with anti-CLAG9 antibodies (B). Anti-VAR2CSA antibodies also localized VAR2CSA on the erythrocyte membrane of both permeabilized and nonpermeabilized IRBCs of the C4S-adherent parasites (C and D)Goel S, Valiyaveettil M, Achur RN, Goyal A, Mattei D, Salanti A, Trenholme KR, Gardiner DL, Gowda DC. Dual stage synthesis and crucial role of cytoadherence-linked asexual gene 9 in the surface expression of malaria parasite var proteins. Proc Natl Acad Sci U S A. 2010 107:16643-8. Analysis of expression and localization of Maurer’s cleft–associated proteins in IRBCs. Confocal immunofluorescence analysis of resident (REX-PFI1735c, SBP1-PFE0065w, and Pf332-PF11_0507) or transiently associated (KAHRP-PFB0100c and PfEMP1) Maurer’s cleft proteins. Colocalization of the resident Maurer’s cleft marker MAHRP-MAL13P1.413 with PfEMP1 in streptolysin O–pretreated IRBCs demonstrates that PfEMP1 is associated with Maurer’s clefts.Cooke BM, Buckingham DW, Glenister FK, Fernandez KM, Bannister LH, Marti M, Mohandas N, Coppel RL. A Maurer's cleft-associated protein is essential for expression of the major malaria virulence antigen on the surface of infected red blood cells. J Cell Biol. 2006 172:899-908. A and B. GFP fluorescence in live 3D7 (A) or D10 (B) parasites expressing wild-type REX2GFP from an episomal vector. GFP fluorescence appears as dots in the host cell cytoplasm typical for Maurer’s cleft localization. Nuclei are stained with DAPI (blue); merges with bright field images (bf) are shown. D. IFA of acetone-fixed infected RBCs expressing REX2GFP and stained with anti-GFP (green) and anti-KAHRP (red) antibodies. Overlays are shown as indicated above each panel. The last panel shows an overlay of all three images (merged). E. IFA of acetone-fixed infected RBCs expressing REX2GFP and stained with anti-GFP (green) and anti-BiP (red) antibodies. Overlays of panels are shown as in (D). Size bars are 2 mm.Haase S, Herrmann S, Grüring C, Heiber A, Jansen PW, Langer C, Treeck M, Cabrera A, Bruns C, Struck NS, Kono M, Engelberg K, Ruch U, Stunnenberg HG, Gilberger TW, Spielmann T. Sequence requirements for the export of the Plasmodium falciparum Maurer's clefts protein REX2. Mol Microbiol. 2009 71:1003-17. Copyright John Wiley & Sons Ltd. 2010. Confocal fluorescence microscopy images of transfected 3D7 P. falciparum-infected RBCs expressing a GFP chimera directed to the red blood cell membrane skeleton. DIC image, the GFP fluorescence signal and an overlay of a Knob-Associated Histidine-Rich Protein 1-123-GFP transfectant Scale bar = 5 µm. The top row shows an early trophozoite stage parasite with KAHRP present in the endomembrane system of the parasite and in the red blood cell cytoplasm. The punctate fluorescent signal in the infected red blood cell (middle row) demonstrates a brief association of the chimera with the Maurer’s clefts. 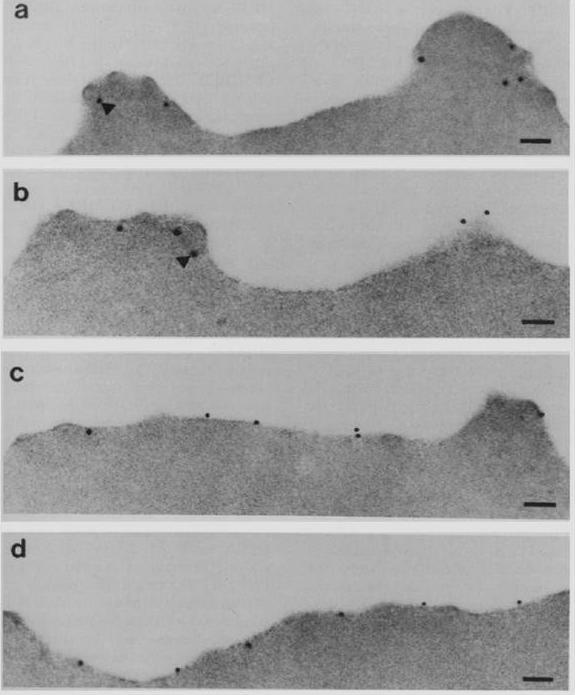 The bottom row illustrates the association of KAHRP with the cytoplasmic face of red blood cell membrane.Tilley L, McFadden G, Cowman A, Klonis N. Illuminating Plasmodium falciparum-infected red blood cells. Trends Parasitol. 2007 23:268-77. Transient co-localization of KAHRP, PfSBP1, PfEMP1, PfEMP3 and PfSAR1p to Maurer’s clefts in ring stage P.falciparum-infected erythrocytes. First row: co-localization of KAHRP (green) with PfSBP1 (red). Second row: co-localization of KAHRP (green) with PfEMP1 (red). Third row: co-localization of PfSAR1p (green) with PfEMP3 (red). Fourth row: co-localization of PfSAR1p (green) with PfSBP1 (red). The third window in each row represents the merging of the red and green channels. Yellow areas represent regions of co-localization.Wickham ME, Rug M, Ralph SA, Klonis N, McFadden GI, Tilley L, Cowman AF. Trafficking and assembly of the cytoadherence complex in Plasmodium falciparum-infected human erythrocytes. EMBO J. 2001 20(20):5636-49. SEMP1 expression during blood stage development. Immunofluorescence assays of MeOH-fixed RBCs infected with 3D7 expressing SEMP1 with a C-terminal 3xHA tag, co-labelled with rat a-HA and mouse a-KAHRP antibodies. 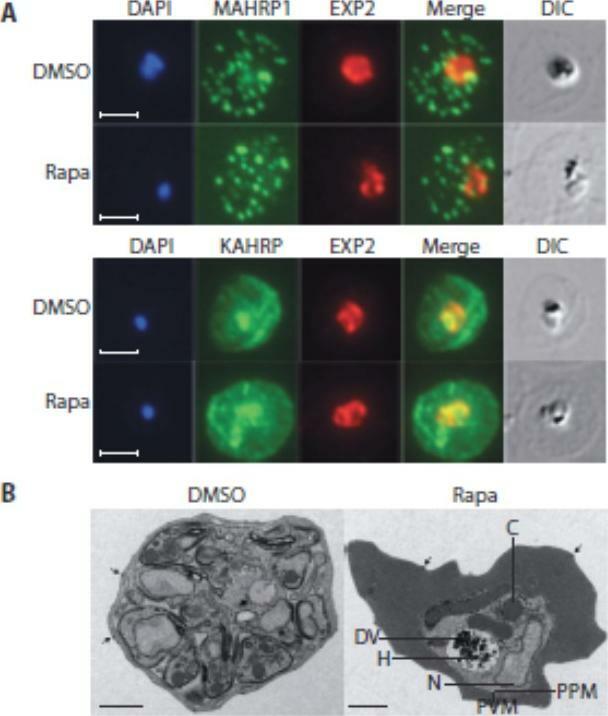 In later stages SEMP1-3xHA is further transported to the RBC membrane and partially localizes with KAHRP.Dietz O, Rusch S, Brand F, Mundwiler-Pachlatko E, Gaida A, Voss T, Beck HP. Characterization of the Small Exported Plasmodium falciparum Membrane Protein SEMP1. PLoS One. 2014 9(7):e103272. Live transgenic cell lines reveal fluorescent chimera (N-terminal 63 amino acids of KAHRP including the signal sequence (red) and PEXEL (blue) attached to GFP; 2: N-terminal 69 amino acids of KAHRP attached to GFP; 3: N-terminal 63 amino acids of KAHRP plus seven alanine residues which act as a spacer between the PEXEL) expression in different parts of P. falciparum-infected erythrocytes. Shown as labelled are K63-GFP, K69-GFP and K63A7. Shown for each panel block are ring, trophozoite (troph) and schizont stages with GFP fluorescence (first image), DAPI nuclear stain (second image), phase contrast image (third image) and merge of the GFP and phase contrast image (fourth image). Strong GFP fluorescence is typically seen in trophozoites and schizonts for all GFP chimeras that are located in or transit the parasitophorous vacuole.Knuepfer E, Rug M, Cowman AF. 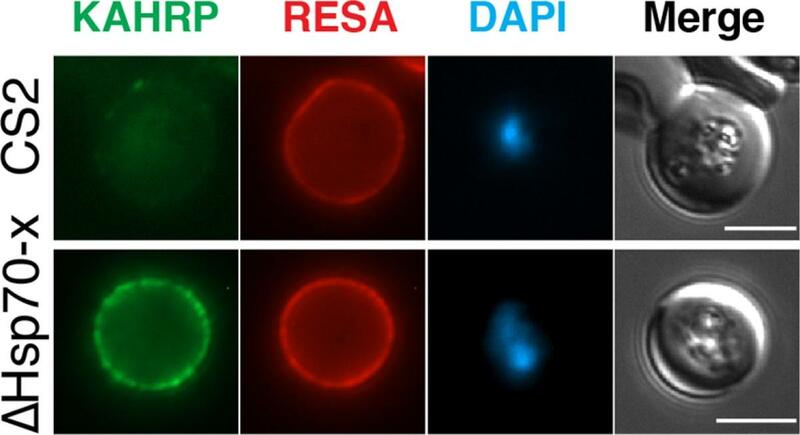 Function of the plasmodium export element can be blocked by green fluorescent protein. Mol Biochem Parasitol. 2005 142(2):258-62. 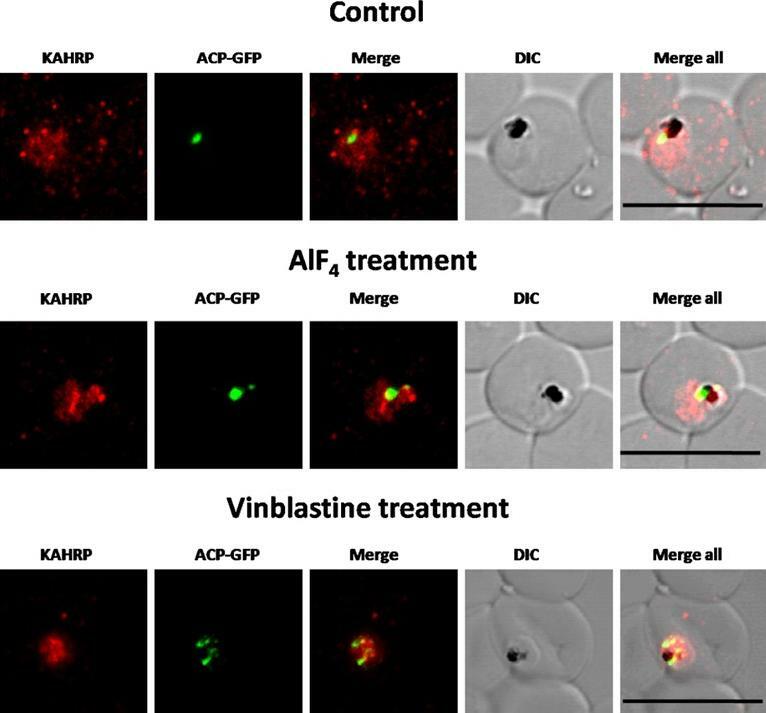 Immunofluorescence based co-localization of KAHRP (using anti-K2A1 antibodies) and PfEMP1 (using anti-VARC antibodies) in P. falciparum infected erythrocytes. Confocal laser scanning microscopy images of iRBCs showing individual images of DAPI stained parasite nuclei (blue), KAHRP (green), PfEMP1 (red), merged images of KAHRP and PfEMP1 and an overlay of the above on a DIC (differential interference contrast) image of the iRBC. Co-localizations are seen in yellow (red arrows). The red bar in each image corresponds to a scale of 2 mm. (a) Optical slice of the plasma membrane of a trophozoite infected RBC, showing extensive co-localization. (b) Cross-section of a trophozoite-infected RBC exhibiting co-localization on RBC membrane.Ganguly AK, Ranjan P, Kumar A, Bhavesh NS. 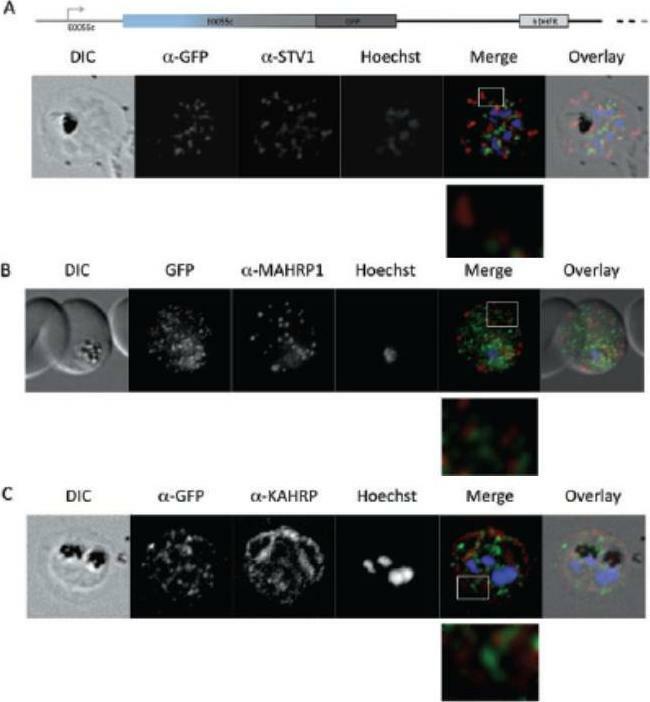 Dynamic association of PfEMP1 and KAHRP in knobs mediates cytoadherence during Plasmodium invasion. Sci Rep. 2015 Mar 2;5:8617.
c Immunofluorescence microscopy of sexually induced PfGEXP5-GFP transfectants (14 h pi), probed with rabbit anti-GFP (green) and mouse anti-Pfs16 (red) antibodies. PfGEXP5-GFP is expressed and exported to the host cell cytoplasm in Pfs16-positive cells (c) d Immuno-fluorescence microscopy of sexually induced PfGEXP5-GFP transfectants (14 h pi, top) and an asexual trophozoite from the same line (bottom), probed with anti-GFP (green) and anti-KAHRP (red) antibodies. Scale bars 3 μm. PfGEXP5-GFP positive cells did not exhibit KAHRP labelling at the RBC surface, while KAHRP-positive cells (i.e., asexual stages) were negative for exported PfGEXP5-GFP (d).Tibúrcio M, Dixon MW, Looker O, Younis SY, Tilley L, Alano P. Specific expression and export of the Plasmodium falciparum Gametocyte EXported Protein-5 marks the gametocyte ring stage. Malar J. 2015 14:334. Correct PEXEL positioning is essential for export. 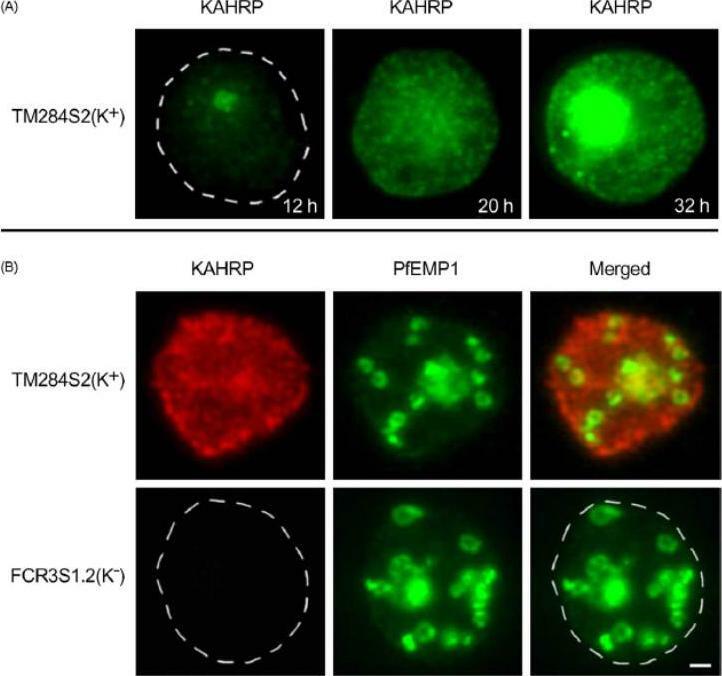 (a) KAHRP1–96 and KAHRPD38–48 are exported to the P. falciparum-infected erythrocyte but KAHRPD38–53 and KAHRPD38–53 RLQ4A accumulate in the PV and are not exported. KAHRP16Ala, KAHRP10Ala and KAHRP5Ala are exported to the red blood cell. Scale bar, 5 mm.Boddey JA, O'Neill MT, Lopaticki S, Carvalho TG, Hodder AN, Nebl T, Wawra S, van West P, Ebrahimzadeh Z, Richard D, Flemming S, Spielmann T, Przyborski J, Babon JJ, Cowman AF. Export of malaria proteins requires co-translational processing of the PEXEL motif independent of phosphatidylinositol-3-phosphate binding. Nat Commun. 2016 Feb 1;7:10470. Oomycete RxLR does not mediate export in P. falciparum. (a) KAHRP1–96 is exported to the P. falciparum-infected erythrocyte; however, HRPIIss-AVR3a, HRPIIss-PH001D5, REX3ss-AVH5 and REX3ss-AVR1b are not exported but accumulate in the parasite and PV. Scale bar, 5 mm.Boddey JA, O'Neill MT, Lopaticki S, Carvalho TG, Hodder AN, Nebl T, Wawra S, van West P, Ebrahimzadeh Z, Richard D, Flemming S, Spielmann T, Przyborski J, Babon JJ, Cowman AF. Export of malaria proteins requires co-translational processing of the PEXEL motif independent of phosphatidylinositol-3-phosphate binding. Nat Commun. 2016 Feb 1;7:10470. Effect of PTEX88 knockdown on P. falciparum protein export. Immunofluorescence assays showing that exported proteins A: RESA, B: STEVOR, C: SBP1, D: KAHRP, E: RIF50, F: PfEMP1 are still exported after knockdown of PTEX88. RESA (an early expressed PEXEL protein), STEVOR (a PEXEL protein containing transmembrane domains), skeleton binding protein 1 (SBP1; a PNEP), KAHRP (a soluble PEXEL protein), RIF50 (a PEXEL protein containing transmembrane domains) and PfEMP1 (a PNEP containing a transmembrane domain that is exported to the erythrocyte surface.Chisholm SA, McHugh E, Lundie R, Dixon MW, Ghosh S, O'Keefe M, Tilley L, Kalanon M, de Koning-Ward TF. 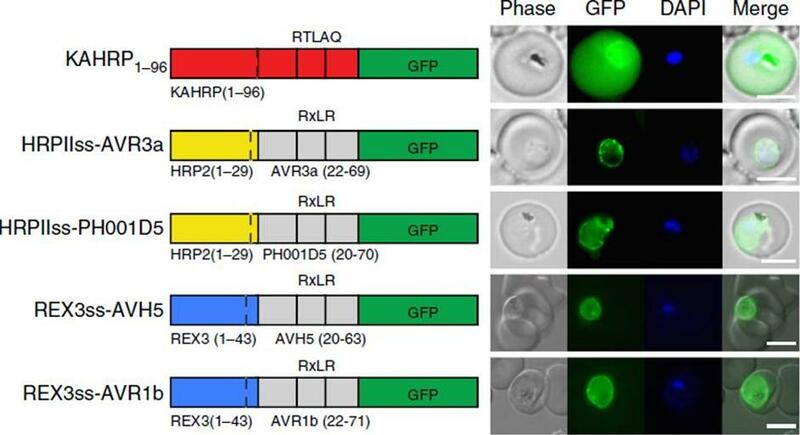 Contrasting Inducible Knockdown of the Auxiliary PTEX Component PTEX88 in P. falciparum and P. berghei Unmasks a Role in Parasite Virulence. PLoS One. 2016 Feb 17;11(2):e0149296. Translocation arrested substrates induce a pan export block that slows parasite development. (A) Representative live fluorescence images of the cell line expressing endogenous SBP1 fused to mDHFR-GFP (SBP1-mDHFR-GFPendo) grown with (+WR) and without WR (control). DIC, differential interference contrast. Size bar: 5 μm. 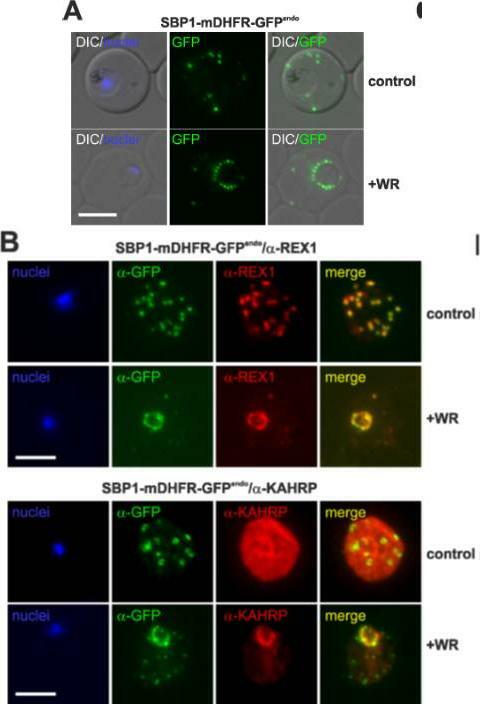 (B) IFA of SBP1-mDHFR-GFPendo parasites using α-REX1 and α-KAHRP in parasites treated with (+WR) and without (control) WR. Size bars: 5 μm. Mesén-Ramírez P, Reinsch F, Blancke Soares A, Bergmann B, Ullrich AK, Tenzer S, Spielmann T. Stable Translocation Intermediates Jam Global Protein Export in Plasmodium falciparum Parasites and Link the PTEX Component EXP2 with Translocation Activity. PLoS Pathog. 2016 May 11;12(5):e1005618. Different types of proteins pass through the same translocon. (A-D) Representative images of live P. falciparum parasites grown in the presence (+WR) or absence of WR (control), expressing the constructs shown schematically above each panel. The skip peptide is indicated by a grey box labelled 2A. The two proteins expressed from the same open reading frame are shown skipped. DIC, differential interference contrast. Size bars: 5 μm. A schematic of the co-block is shown for A. The yellow box indicates the mature PEXEL.Mesén-Ramírez P, Reinsch F, Blancke Soares A, Bergmann B, Ullrich AK, Tenzer S, Spielmann T. Stable Translocation Intermediates Jam Global Protein Export in Plasmodium falciparum Parasites and Link the PTEX Component EXP2 with Translocation Activity. PLoS Pathog. 2016 May 11;12(5):e1005618. 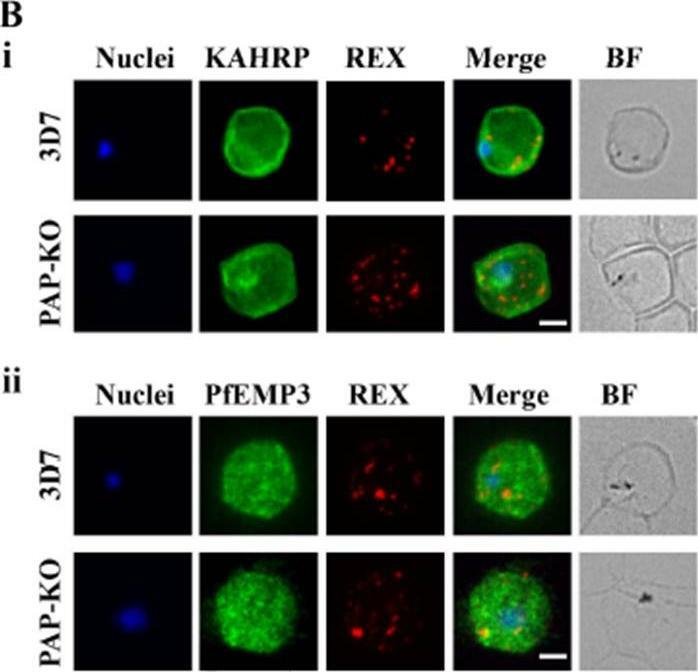 Targeted gene disruption of PfPAP changes the filterability of the infected RBCs but not the expression or localization of KAHRP, REX1, and PfEMP-3. B). Immunofluorescence using anti-KAHRP, REX1, and PfEMP-3 antibodies on 3D7 and 3D7_PAP KO show no difference in the location of these proteins. C). Electron microscopy of 3D7_PAP-KO showing electron dense structures at the surface of the infected erythrocyte indicative of the presence of knobs. Bars are 5 mm.da Silva FL, Dixon MW, Stack CM, Teuscher F, Taran E, Jones MK, Lovas E, Tilley L, Brown CL, Trenholme KR, Dalton JP, Gardiner DL, Skinner-Adams TS. 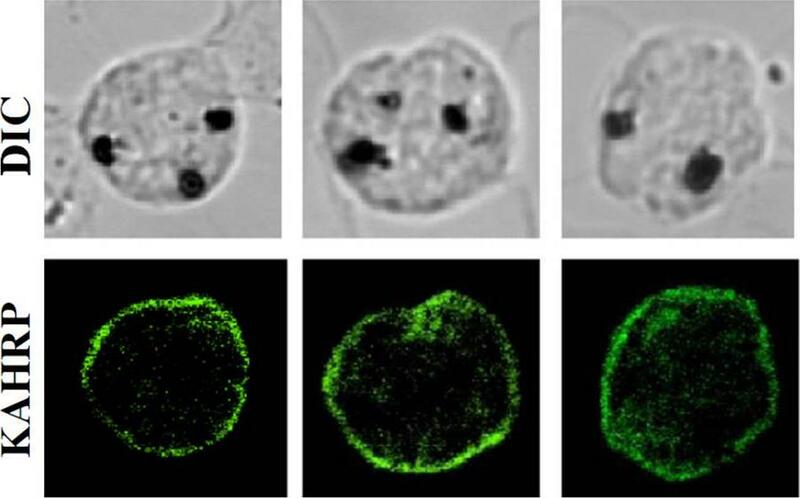 A Plasmodium falciparum S33 proline aminopeptidase is associated with changes in erythrocyte deformability. Exp Parasitol. 2016 Jun 30. pii:S0014-4894(16)30135-7. The export of KAHRP and SBP1 in the PTEX150Δ125-HA mutant compared to full length PTEX150-HA parasites. 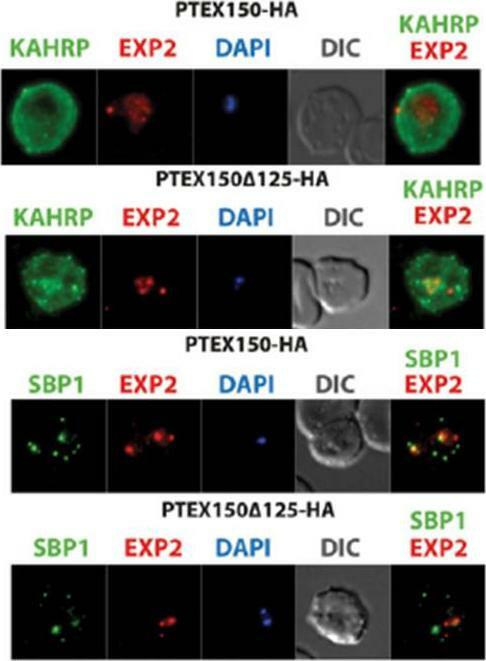 PTEX150-HA and PTEX150Δ125-HA parasites were synchronized to an invasion window of 5 h. The regions occupied by the parasite are indicated by DAPI and EXP2 staining. 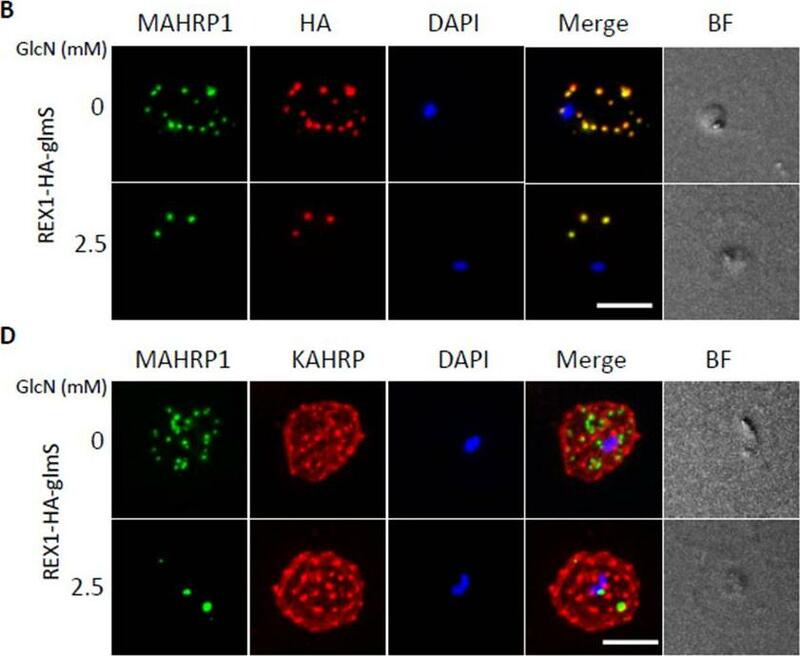 KAHRP is a PEXEL protein, which initially displays a diffuse staining of the erythrocyte cytosol before accumulating in punctate regions below the plasma membrane of the host cell. SBP is a PNEP that localizes to punctate vesicular structures called Maurer’s clefts (MC) in the host cytosol. IFAs were counterstained with antibodies to EXP2 to delineate where the boundaries of the parasite. No significant difference between the PTEX150Δ125-HA and PTEX150-HA parasite lines was observed.Elsworth B, Sanders PR, Nebl T, Batinovic S, Kalanon M, Nie CQ, Charnaud SC, Bullen HE, de Koning Ward TF, Tilley L, Crabb BS, Gilson PR. Proteomic analysis reveals novel proteins associated with the Plasmodium protein exporter PTEX and a loss of complex stability upon truncation of the core PTEX component, PTEX150. Cell Microbiol. 2016 18(11):1551-1569. RhopH proteins are deposited in the PV and exported via PTEX. IFA of 13F10 showing export of RhopH proteins after growth with or without TMP for 48 h. Colocalization with exported HRP2 or SBP1, as indicated. Scale bars, 5 μm. 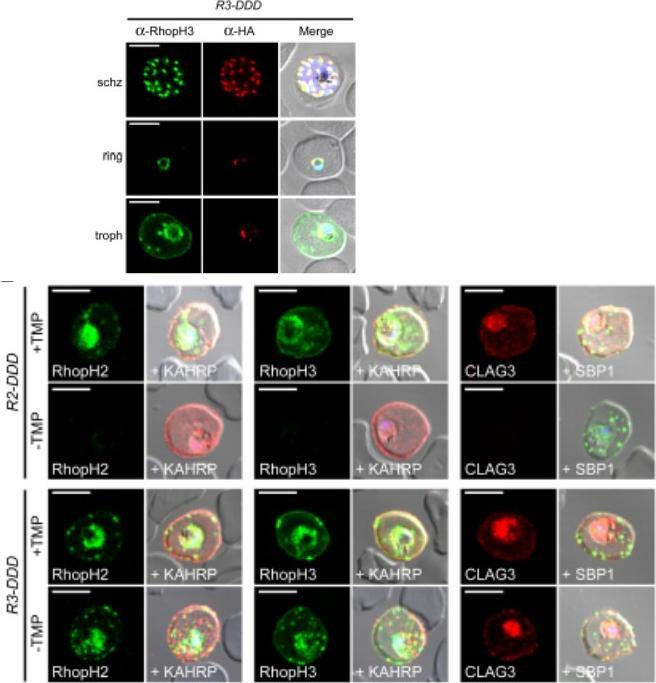 Export of RhopH2 and RhopH3 were both fully blocked in trophozoite-stage parasites grown for 48 h without TMP. 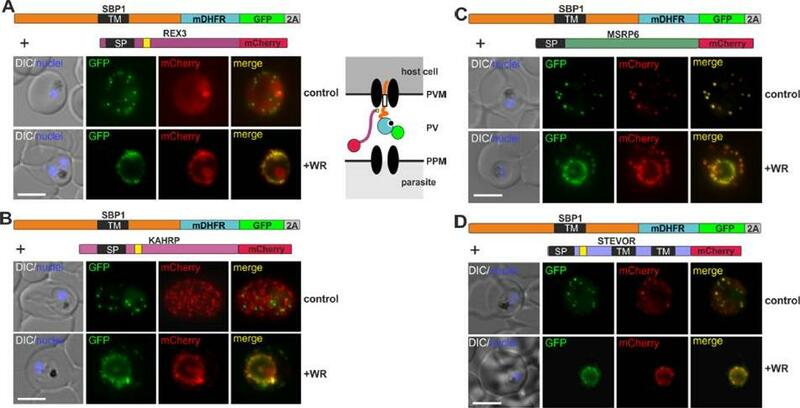 Colocalization with HRP2, a parasite protein carrying the canonical PEXEL export signal showed both proteins trapped in the vacuole upon PTEX knockdown. CLAG3 export requires PTEX activity as TMP removal prevented its movement out of the PV (bottom row); colocalization with SBP1, another PTEX substrate.Ito D, Schureck MA, Desai SA. An essential dual-function complex mediates erythrocyte invasion and channel-mediated nutrient uptake in malaria parasites. Elife. 2017 Feb 21;6. (D) IFA of R3-DDD (conditional RopH3 mutant) probed with indicated antibodies at each parasite stage. Note that both antibodies detect protein in schizont rhoptries, but that only the anti-RhopH antibody detects export to the host membrane in trophozoites. Scale bars, 5 μm. 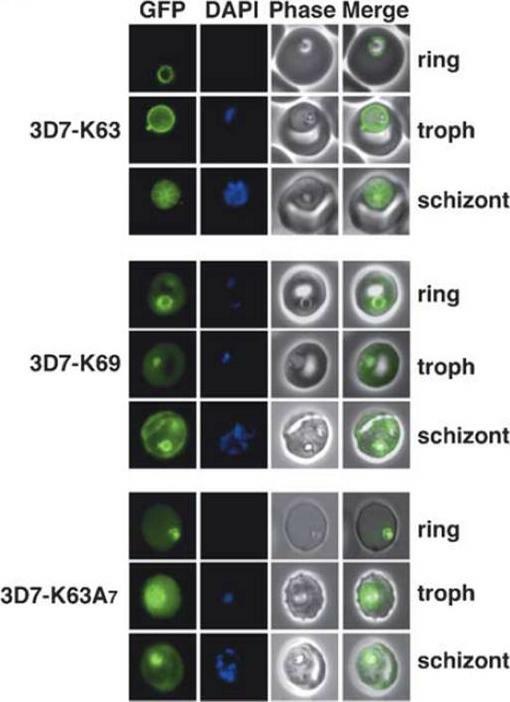 (E) Trophozoite-stage IFAs of indicated parasites cultivated with and without TMP for 48 h, showing that knockdown abolishes each member of the complex in R2-DDD (conditional RopH2 mutant) but not R3-DDD. 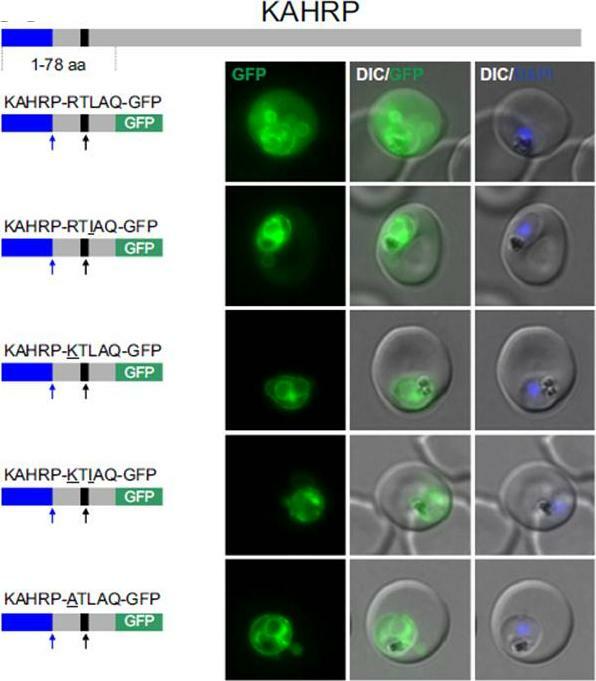 Co-localization is shown with exported parasite proteins KAHRP or SBP1 (red or green in merge panels, respectively). Scale bars, 5 μm. The RhopH complex appears to be secreted into the PV (upper panel), suggesting that its member proteins must cross the bounding PVM to enter host cytosol and eventually reach the erythrocyte surface. 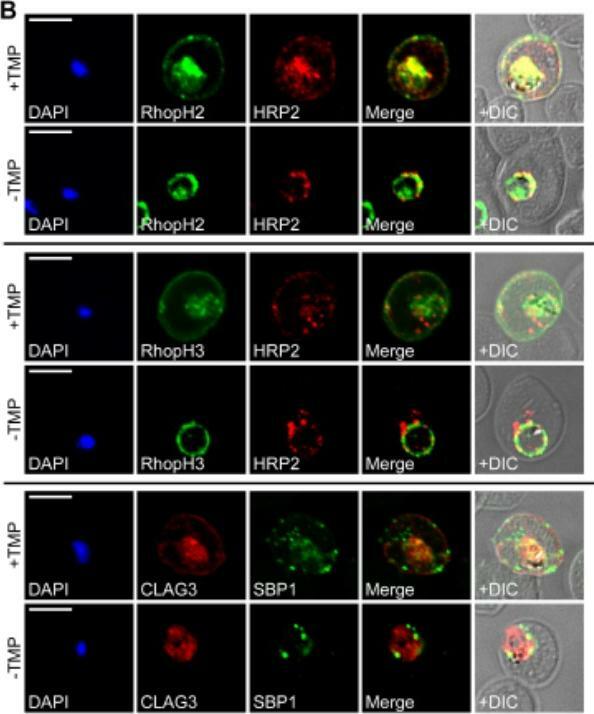 While TMP removal rendered all three RhopH proteins undetectable in the R2-DDD parasite, these proteins and their transfer to trophozoites were preserved inR3-DDD.Ito D, Schureck MA, Desai SA. An essential dual-function complex mediates erythrocyte invasion and channel-mediated nutrient uptake in malaria parasites. Elife. 2017 Feb 21;6. PMID: 28221136. The expression of cytoskeletal binding proteins KAHRP is increased in ΔHsp70-x. 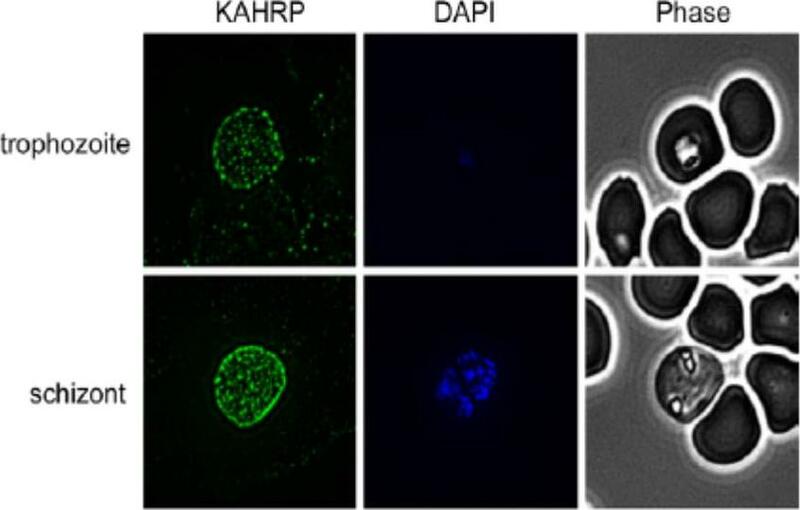 (a) Immuno fluorescence microscopy of 16-24 hpi parasites indicates expression of the exported, knob localized KAHRP protein but not RESA appears higher in ΔHsp70-x. Antibodies to the cytoskeletal binding proteins ring exported surface antigen (RESA) and knob associated histidine rich protein (KAHRP) indicated the MFI was significantly higher for KAHRP but not RESA in the mutant. The CS2 parasite line in which the ΔHsp70-x clones were derived from stably expresses the single VAR2CSA PfEMP1 allele, which binds to chondroitin sulfate A (CSA) normally present in the placenta.Charnaud SC, Dixon MWA, Nie CQ, Chappell L, Sanders PR, Nebl T, Hanssen E, Berriman M, Chan JA, Blanch AJ, Beeson JG, Rayner JC, Przyborski JM, Tilley L, Crabb BS, Gilson PR. The exported chaperone Hsp70-x supports virulence functions for Plasmodium falciparum blood stage parasites. PLoS One. 2017 12(7):e0181656.